The definitive guide to heart health from two of America's most respected doctors at Cleveland Clinic, the number-one hospital for cardiac care in America. Are you one of the eighty-two million Americans currently diagnosed with cardiovascular disease-or one of the millions more who think they are healthy but are at risk? Whether your goal is to get the best treatment or to stay out of the cardiologist's office, your heart's health depends on accurate information and correct answers to key questions. 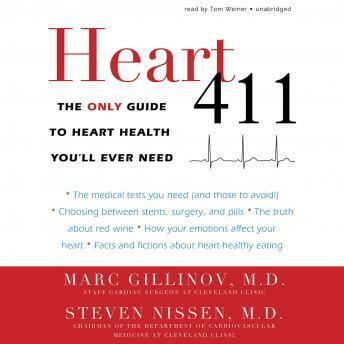 In Heart 411 two renowned experts, heart surgeon Marc Gillinov and cardiologist Steven Nissen, tackle the questions their patients have raised over their decades of practice: Can the stress of my job really lead to a heart attack? How does exercise help my heart, and what is the right amount and type of exercise? What are the most important tests for my heart, and when do I need them? How do symptoms and treatments differ among men, women, and children? Backed by decades of clinical experience and up-to-the-minute research, yet written in the accessible, down-to-earth tone of your trusted family doctor, Heart 411 cuts through the confusion to give you the knowledge and tools you need to live a long and heart-healthy life.